Denver Personal Injury Law Firm Bell & Pollock was recently profiled in Women’s Edition online magazine. “Champions of the people.” It’s a catchy phrase, and a great motto. This motto is the first thing that you see when you enter the offices of personal injury law firm of Bell & Pollock. The attorneys and support staff here strive to live by these words every day. 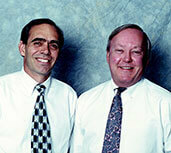 The Bell & Pollock law firm was founded by Gary Bell and Bradley Pollock. They met many years ago when they worked at a larger firm that handled all types of cases. Gary and Bradley discovered that they preferred to work on individual cases rather than on corporate accounts. In 1984, they decided to strike out on their own and started their own firm. Over the last 30 years, the firm has grown to include additional attorneys, a full support staff, and paralegals. Kay is the office manager and makes sure that the operations in the office flow smoothly. Kelly and Karen are the “detail» people in the office; as paralegals, they are the bridge between attorneys and clients. The Bell & Pollock law firm works through a “legal game plan” with each client, from the free initial consultation to the final meeting. The first meeting is used to gather information about the potential case. What happened, in detail? Then they educate the client about the process, explain the next steps, and plan out a strategy for moving forward. If the client decides to hire Bell & Pollock, then the law firm retrieves any pertinent records, builds an action report, and details the investigation process. Tom has just completed an injury case with Bell & Pollock, and he gives them high marks. “I was afraid of finding the stereotypical lawyer, out for the money rather than coming to a fair and right conclusion,” Tom says. He interviewed multiple law firms before deciding to hire Bell & Pollock. Please call Bell & Pollock at 303-795-5900 or toll free at 1-800-559-5920 to discuss your situation. Their office is located at 5660 Greenwood Plaza Boulevard, Suite 220, in Greenwood Village, Colorado. You can access videos and e-books on a variety of injury topics at their websites: www.championsofthepeople.com or www.bellpollock.com. You can also follow Bell & Pollock on Facebook and Twitter or sign up for their newsletter. Tune in to TalkRadio 630 KHOW on Saturday mornings at 7:00 a.m. to hear their weekly radio show. You can listen to their Injury Radio Shows on Sunday mornings at 7:30 a.m. Just tune into KOOL105, MIX100, or 92.5 The Wolf.